On August 31, up to 45,000 people will gather in the Valencian town of Buñol to throw tomatoes at each other. Shops will cover their windows with plastic bags and the streets will run red with over 120 tons of vegetable juice. Although the origins of the tradition are not completely certain, there are popular theories suggesting that it was all started by a small group of young people. The tradition is said to have begun in August of 1945. Young people were attending a festival in the town of Buñol and wanted badly to be a part of the festivities. They stormed a stage of musicians and began to dance and party with them in a festive manner. As a result, one of the musicians fell from the stage and knocked over a market stall full of fruits and vegetables into a disgruntled crowd of festivalgoers. It is said that those attending the festival began to pick up the displaced fruits and pelt them at one another. The throwing continued until authorities broke up the madness. 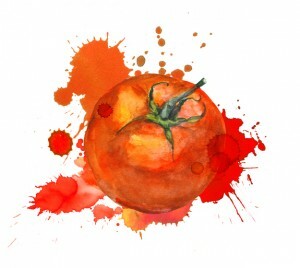 The following year, those who remembered the festival quarrel brought tomatoes from home and decided to relive the vegetable fight again at the same event; pelting tomatoes at one another in a lively and fun manner. The throwing of tomatoes or, La Tomatina, was banned from the town of Buñol in the early 50’s. The authorities did not find in amusing and there were also many complaints from the older population of the town. In 1957, a tomato burial parade was held in August in the town as a sign of protest. Musicians played funeral tunes as they marched as coffin filled with the infamous vegetable. The people of the town were moved by the unity of the young people, and La Tomatina Buñol became an official festival! The festival was broadcasted live and as a result gained national and international attention. Each year, the festival increases in participation and vegetable count. Last year, 2015, around 45,000 people were in attendance and even more participants are expected to join this year. La Tomatina of Buñol was declared the Festivity of International Tourist Interest by the Secretary of Department of Tourism. The tomatoes must be squashed prior to throwing. Tomato is the ONLY throwing object permitted. Participants must make way for trucks. Tomatoes must stop being thrown after a timed indicator alarm. AESU offers two trips to Spain: The Euro Explorer and the Continental. Explore Spain and its beautiful scenery, plus experience the excitement of La Tomatina Buñol. If you have any questions or want help booking your Spanish adventure, please contact AESU by calling 800-638-7640, or fill out the contact form found on our website. This entry was posted on Thursday, August 18th, 2016	at 5:11 pm	. You can follow any responses to this entry through the RSS 2.0	feed. Both comments and pings are currently closed.